Tuff Shed $1935 (8'x10') TUFF SHED buildings are manufactured and installed locally, with domestically produced materials. Tuff Shed reviews. Rubbermaid Big Max (Home Depot) $649 (7'x7') Has durable floors and molded-in grooves. Assembly is quick and easy with the interlocking panels. Rubbermaid Shed reviews. Arrow $438 (8'x10') Leading designer, manufacturer and distributor of steel storage sheds delivered in kit form. Arrow Shed reviews. Lifetime (Sam's Club) $989 (8'x10') Made from powder-coated steel and double-wall high density polyethylene. Lifetime Shed reviews. Are you running out of storage space in your garage? If you have the room in your yard, then a backyard storage shed is the perfect solution to your storage needs. You may have many outdoor toys, bicycles or gardening and lawn care supplies that just don’t fit in the garage anymore. Your family is growing and so is your need to store more stuff. You need a storage shed but you’re just not sure how to choose a backyard storage shed. First step in how to choose a backyard storage shed is to do research on the many different brands and types of sheds. Save yourself some time from running around from store to store to check them out. Do an internet search first to read up on the different brands on the market. Visit the websites of the manufactures. Some of the top manufacturers to consider are Rubbermaid, Tuffshed, Lifetime Sheds and Arrow Sheds. Most websites will have customer feed back pages, read all of the customer comments available. Check into the warranty’s on each shed brand you are interested in. Compare the prices on the different brands. There are many other things to consider then the brand when you are choosing a backyard shed. Your local weather conditions will have a lot to do with what you choose. If you live in a state where hurricanes are possible, durability will be important. If you live in a state such as Arizona, the heat will play a big part on how your shed stands up to the sun exposure. Next you will need to decide on the size of the shed you will need. Figure out exactly what it is that you will be storing out in the shed. Check with your city to see what the codes and ordinances are for sheds. There may be restrictions on the size you can put up. 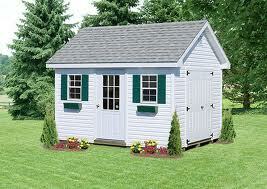 Some cities require the shed be a certain distance from your property line. Depending on your city ordinances and the size of the shed, you may need to take the plans for the shed in for approval. It also may be necessary to have the shed inspected once it is finished. Once your size is decided and you have approval from the city, you can decide on where to build it. Find a location in your yard that will allow you easy access to the storage shed. You want to be able to move in and out of it easily with the equipment you will store in it. The area should also be clear of trees and shrubs and the land will need to be flat. So, depending on the spot you choose will depend on how much work you will need to do to prepare the foundation and the area for the shed. Now that you have narrowed down the brands, and your size and style is chosen, check the company’s websites to find the dealer closest to you. Check the circulars in your local newspaper to check to see if the shed you are interested in purchasing is on sale. When you go to the store to purchase the shed, take the time to talk to the sales person and ask any questions that are still unanswered. There is always the possibility that the sales person will show you something completely different then you had picked out, and that it will actually work out better for you. So keep an open mind when you visit the store. Remember, once you purchase your shed, you will need to take it home, assemble it and secure it to its foundation. The salesman should be able to provide valuable information to you as far as assembly. And while you are at the store, make sure you purchase any tools you will need to assemble the shed. Keep in mind that if you don’t have a big enough vehicle to transport the new shed, you will need to borrow a truck or rent one. Once your shed is home, it’s time to begin the assembly. Make sure you read the instructions completely before you begin to assemble the shed. If you have any questions, the manufacturer’s website will also have valuable information on assembling the shed. By installing a backyard storage shed, you will not only be solving your storage problems, you will be adding value to your home. The better value the shed is, the more value that is added to your home. Keep this in mind when you choose your backyard storage shed.